Parking: There is plenty of parking available at Bonne Nuit during the winter months, in the summer it can be more difficult as it is quite a busy little bay. There are a number of car parks at Greve de Lecq but kayakers tend to use the large car park with the Jersey Round Tower in the middle. Sometimes people drop their kayaks off at the slip, if you do this please take care not to block access, as it can be quite busy at times. Refreshments: There is a cafe at Bonne Nuit, which is open during the summer whilst there are more options at Greve de Lecq. Colleens Cafe is open most of the year, during the summer a small kiosk is often open on the slip plus a larger cafe on the eastern side of the bay, which is closed during the winter. 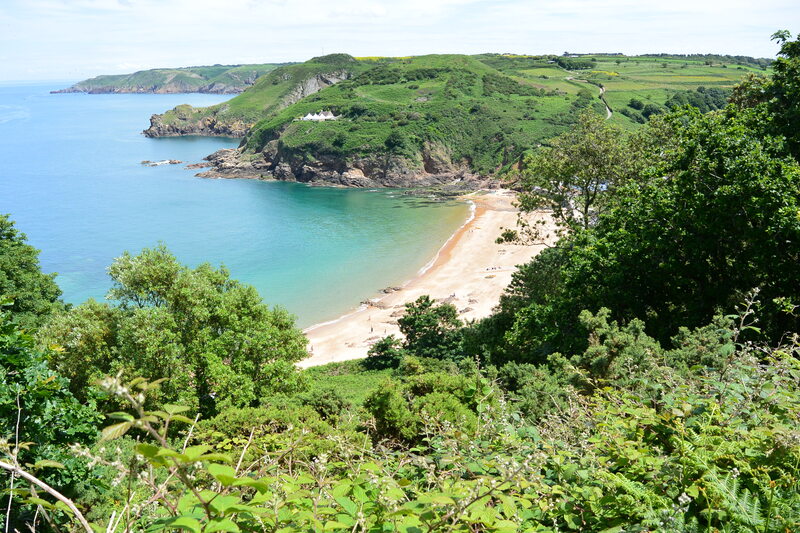 There are two pubs in the bay, the Moulin de Lecq and the Prince of Wales. Both offer food and good beer. Looking into Bonne Nuit towards high water on a winters day. In the summer there would be far more many boats moored here. Heading west from Bonne Nuit there are numerous narrow passages, which can be navigated in a kayak. Just stay in close and the opportunities will be revealed. One of the great attractions is that the nature of the reefs varies dramatically at each stage of the tide. There is always something new to explore in this area. On the flood tide a small race develops off Fremont Point. One of the main attractions of this stretch of coast is Wolf’s Caves. The landing place is in the wide boulder filled gully, which is directly underneath the television mast. 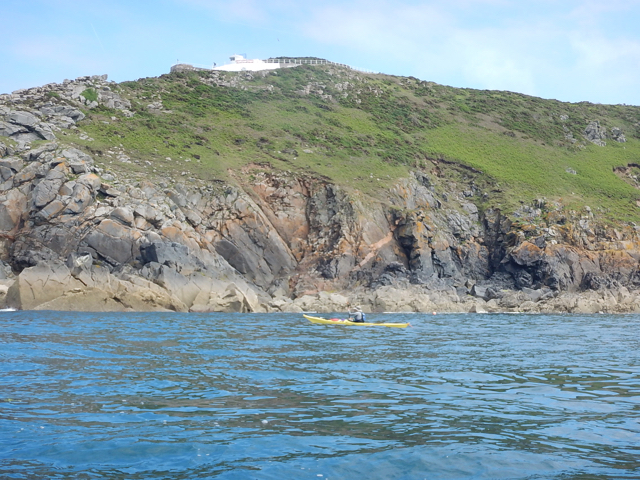 A steep path used to wind down from above but it is no longer accessible and so any paddlers who land on the rocks are virtually guaranteed, now, to have the area to themselves. 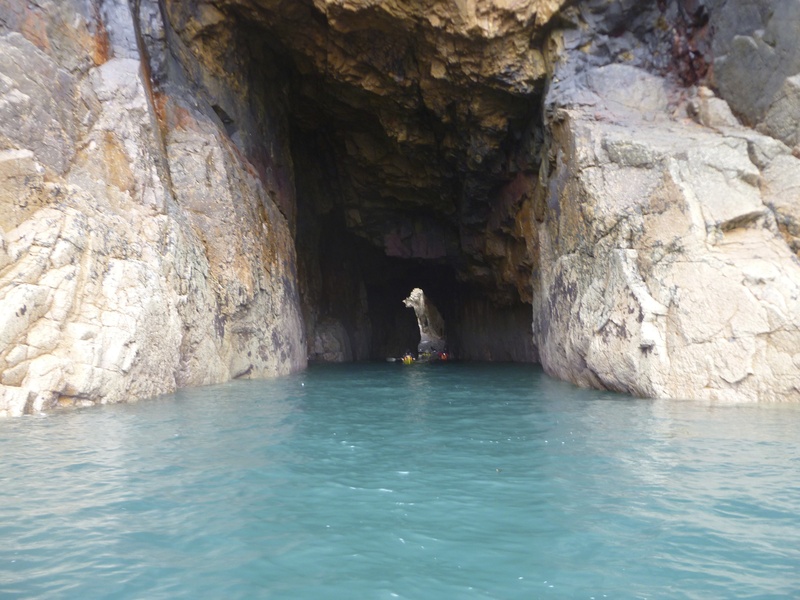 Although landing is possible at all stages of the tide it is best to visit at low water because it is then possible to walk through the cave system. The entrance is the narrow cleft in the western wall. Most people enter the cave, carefully climb over the boulder close to the entrance and then retrace their steps. On a warm summers day though an alternative is to swim out of the western entrance and then scramble back around the rocks to the kayaks. It is difficult, if not impossible to land here if there is any swell. From Wolfs Cave to Ronez the coast remains steep although vegetation covered slopes replace the vertical cliffs. There are a number of small beaches, which are perfect places to land for a picnic lunch. Ronez is the highly quarried headland and can hardly be termed attractive but is notable as the most northerly point of Jersey. It is easily identified from the east due to the remains of the harbour infrastructure. When paddling in the area keep an eye open for choughs. These delightful birds have been re-introduced to Jersey, in a project co-ordinated by Jersey Zoo. They first bred in the wild in 2015, after an absence of nearly 100 years, in one of the sheds within the quarry. A couple of hundred metres to the west is Sorel, easily recognized because of the lighthouse, and this marks the start of one of the finest stretches of coastline in Jersey. Between the beach at Ronez and Sorel headland there is a fascinating feature, which is worth exploring if the tide is low and landing on the rocks is possible. The Venus Pool is rather large and deep rock pool, which very few residents of Jersey are aware of. It is possible to scramble down the cliffs from Sorel Lighthouse, but if there is no swell access by kayak is far easier. As it is tucked under the cliffs it is frequently in shade, so an early afternoon visit on a spring tide, will be the best time for the pool to be uncovered and the possibility of sunshine. Swimming in the Venus Pool, near Sorel. On days with no swell it is relatively easy to land the kayaks nearby. 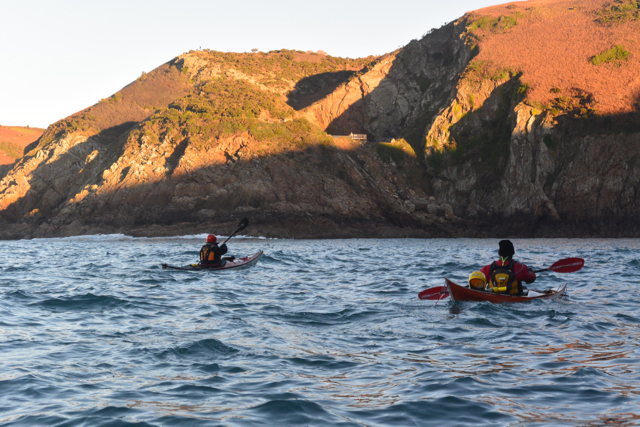 Sorel is very popular headland for fisherman, so paddle aware and don’t become entangled in their lines. Ahead the beach and pier at Greve de Lecq will just be visible but the next couple of miles contains some of the finest kayaking in Jersey. There are numerous caves and inlets along this section of coast but heading from Sorel westwards the principal physical features in in order are. Firstly, Le Mourier Valley, during the wetter winter months a spectacular waterfall cascades down the eastern wall of the gully, at times in the summer it can be virtually dry. A significant piece of wood has been jammed across the back of the gully for a number of years, but its presence cannot be guaranteed in the future. It would be possible to exit here in an emergency but you would probably have to leave the kayaks behind. The remains of the building at the base of the valley are all that is left of one of the first knackers yards in Jersey. Next is Devil’s Hole. A large tunnel with light at the rear marks the entrance into Devil’s Hole, extra care is needed when entering the cave because of the possibility of a larger than normal swell arriving whilst you are in the inner most recesses. If it is very calm it is possible to land at the back of the cave and walk into the base of Devil’s Hole but be aware of falling rocks. The next large physical feature when heading west is Ile Agois. Although Ile Agois is a separate islet, from Col de la Rocque headland it can be difficult to distinguish it from the main bulk of Jersey. It offers a gently sloping southern face but its northern and eastern ramparts are precipitous. A south facing rocky ledge about 5 metres above the boulders is probably the finest picnic spot in Jersey, especially on neap tides when it is a midday high water. The more adventurous can climb to the top, via the grassy slope behind the ledge, but it is often difficult in summer because of the dense gorse. A climbing rope, and the knowledge of how to use it, might be an extremely useful piece of safety equipment. Looking towards Ile Agois. The perfect picnic site is just out of the picture, on the right. On the summit are the remains of a number of circular stone dwellings although why anybody should wish to live on such an isolated outcrop of rock is open to debate. They were probably built sometime during the 7th or 8th Century and were some form of religious settlement. Pottery has been unearthed on the summit plus a hoard of Roman coins has been discovered under the walls of one of the huts. Having struggled to the summit it is virtually certain, that you will have it to yourself, as access from the cliff top is extremely difficult. The path down from Crabbe is not for the faint hearted and in some years is totally impassable. Close to high water on springs it is possible to paddle through the arches at Ile Agois and so complete a circumnavigation of this dramatic stack. Most groups will continue towards Greve de Lecq and wish to explore some of the finest caves to found around the Jersey coastline. What is fascinating is, how the characteristics of the caves change with to the rise and fall of the tide. What might be a stunning experience can change dramatically 3 hours later and not be possible to explore at all. 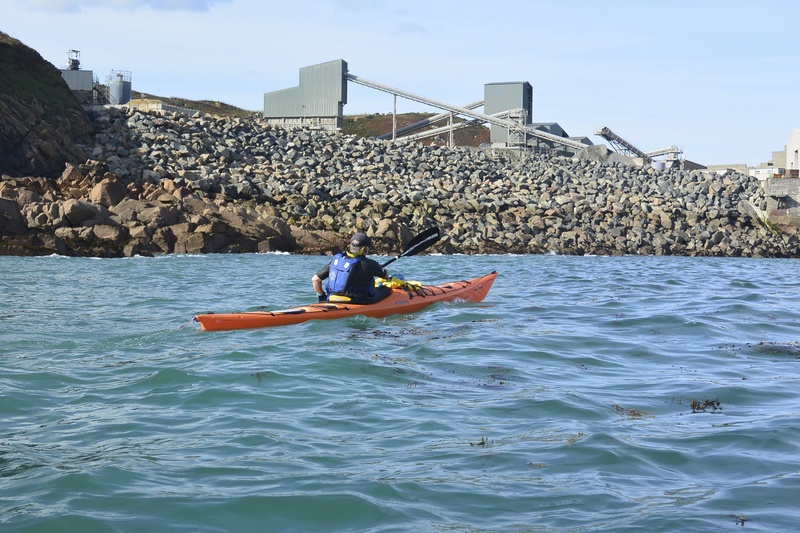 This ever-changing seascape is one of the attractions of paddling along this section of coast, which is one of the most popular sections of the Jersey coastline, with the local paddling community. Just to the west of Rouge Nez there is an obvious sandy beach, which can be quite a pleasant place to stop for lunch if you are trying to avoid the crowds at Greve de Lecq. On the western side of the bay there is a narrow opening in the cliff face, directly opposite a small arch, which is revealed as the tide drops. 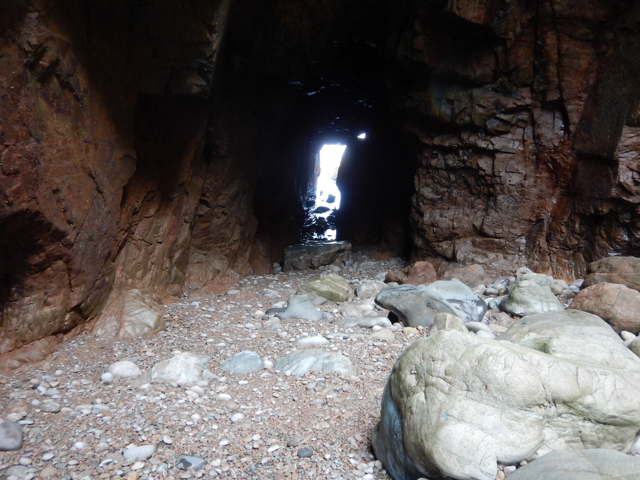 Scramble through this tunnel in the dark and it will bring you out in the third gully out from the beach at Greve de Lecq. In the past you are likely to have had the area to yourself but with the explosion in the number of groups coasteering, particularly during the summer months you are now quite likely to encounter other people. On exiting the western end of the cave, it is possible to scramble up the right and head towards the Octopus Pool. This is an area where generations of Jersey cliff jumpers have cut their teeth and is well worth a visit. The Octopus Pool is a large rock pool, which is just great to swim and play in, whilst nearby is the “Rhino”. A significantly larger jump than the ones in the Octopus Pool, and something which many young Jersey people aspire to do. 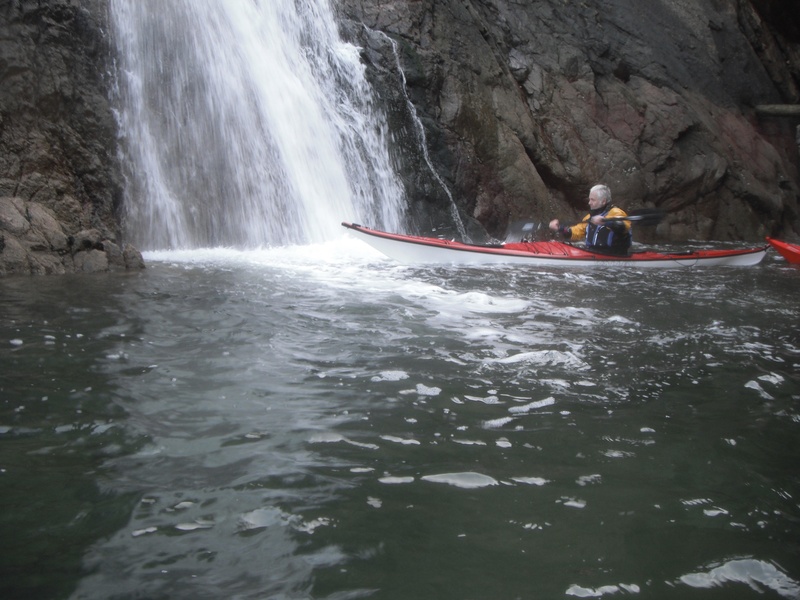 Once you have exhausted the jumping possibilities of the area or time is pressing on, it is simply a matter of swimming back to the beach to be re-united with your kayaks. 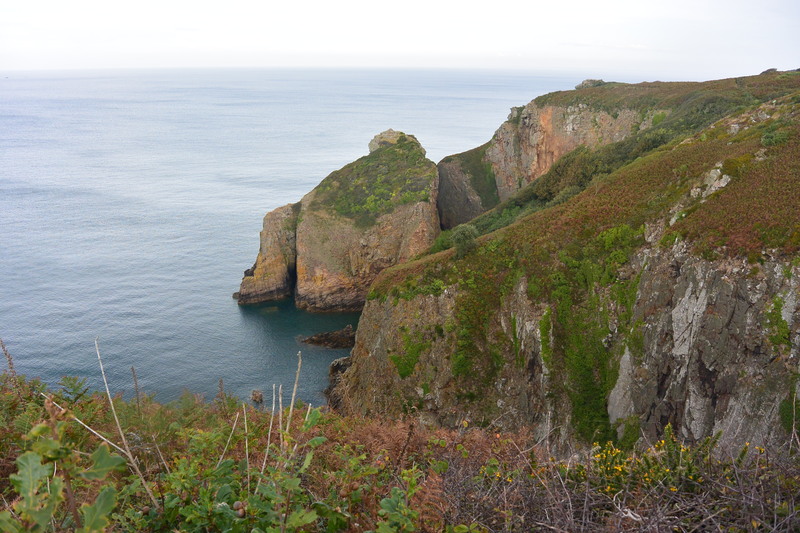 Once you have launched it is quick 5 minute paddle to Greve de Lecq and the end of this section of coastline. Be aware when landing at Greve as there is always the possibility of some swell, and the waves dump here as opposed to be breaking gently. In addition, if the weather is pretty good they are likely to be plenty of swimmers in the water, so just exercise a bit of care. This is a section of coast I never tire of exploring and somewhere I return to time and time again. Sorel/Ronez, although not as significant as off some of the other headlands, around the island. Approaching Ronez Quarry. Remember to keep a look out for the Choughs. From the west, Sorel looks like a rather wild headland. Devil's Hole from the outside looking in, a day with no swell. Devil's Hole from the inside looking out. Devil's Hole bathed in winter sunshine. Ile Agois viewed from the cliff path. The remains of the small huts are close to the rocky summit. Looking east from Greve de Lecq towards a coast with some superb paddling.